If God could write you a letter on seeing you the way He does I think it would go something like this. I see you. I see how hard you work to make things happen. I see your efforts and your heart. I know how hard it is when all your best laid plans and dreams don’t go as planned. I hear your prayers, my child. It breaks my heart too when dreams (promotion, pregnancy, job, book deal, etc) don’t work out. I know you don’t understand. Trust me when I tell you, one day you will be able to look back and know in your heart that the plans I have for you are good even though things haven’t work out as you planned. I am the same God who set the stars in the sky, the planets in motion, and a time for every good purpose and plan for your life. I never promised a life of ease-and this certainly goes for chasing those dreams as well. Life will be a series of ebbs and flows. All the hard times, all the failures, and all the good times will be used for My ultimate plan in your life. You see, nothing that has happened will be wasted. I know you sometimes feel like I’m not there. But child, I’m always here. Sometimes a Father has to stand back and watch their child struggle in order to find their wings and fly. I am your biggest cheerleader, I want you to do well and succeed. I may be quiet at times but I promise I’m still here. Those moments when you wonder where I am and if I even care that your dreams are dying are the times I’m going before you to make your paths straight (Isaiah 45:2). I’m collecting every tear you cry and I’m making a way even though you don’t see it. I am opening and shutting doors because I love you that much. Don’t be so hard on yourself when things don’t work out. Turn to me and let me comfort you. 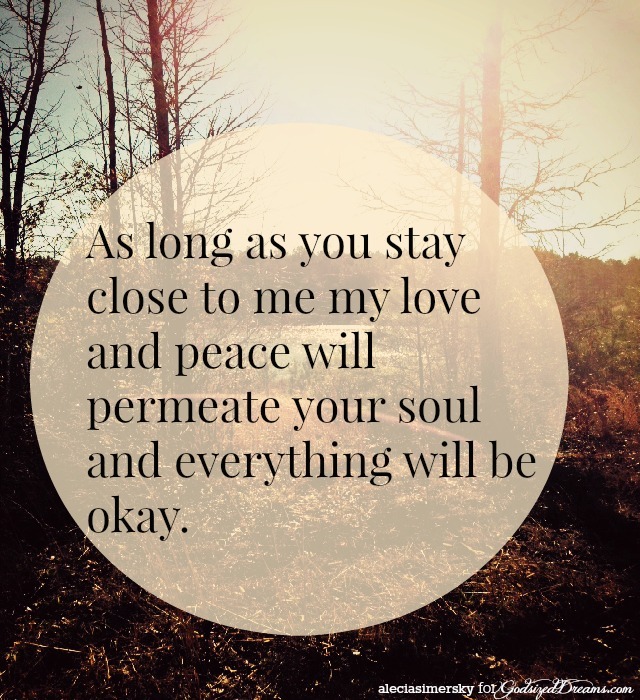 As long as you stay close to me my love and peace will permeate your soul and everything will be okay. Don’t take your eyes off of me. I am the only one whom truly sees what you are feeling. I know you my love. You can’t hide from me. You are my beautiful wonderful child. Don’t ever forget that. What a beautiful letter!! Sometimes we forget when our dreams don’t always go as we plan that God is still with us. God is so good to us and He loves us. Thank you so much for sharing Alecia! It’s easy to forget when we are lost in the pain of losing a dream that God’s plans for us are still good. I know I need this reminder that He hasn’t forgotten me and is always with me. Thanks for being here, Lisa! I am speachless… this was literally my cry to the Lord this morning and here, in my inbox is His answer. Thank you Alecia, this was a timely word, a tangible touch from Heaven. WOW! I’m speechless. God amazes me in how He confirms His thoughts to us through even such things as a blog post. Truly amazing! What a beautiful letter Alecia! So encouraging and so uplifting. Thanks for sharing and God bless you more and more. Thank you, Sabrina. I pray God will bless you as well. Thank you, Satin. It’s so good to see your beautiful face. Sometimes we all need to be reminded we haven’t been forgotten. Hope you are doing well. Your post is so encouraging. It speaks to the many emotions we feel as we go through this journey called life. Thank you. So very encouraged. This was so encouraging, Alecia! Thank you! Wow, wow, wow, Alecia, He is there even when we aren’t feeling it. I love your heart. Much needed today. I’ve read a few other posts along the same lines. God is definately reminding me of His love and care for me. Truth!!! So glad God prompted me to read your letter today, smiling, crying, thankful, Alecia- words of Truth I needed today!